When I travel, I tend to throw whatever knitting project I’m taking with me in my computer bag. Often that means my yarn gets messed up while I’m searching for something else in the bag or even worse gets caught in some of the velcro closures. I’ve been using ziplock bags, but I wanted something I little more permanent. My solution? To sew up some little bags I call yarn sacks. The sacks have eyelets in them which allow me to work with the yarn without removing it at all. This keeps it all neat and tidy. 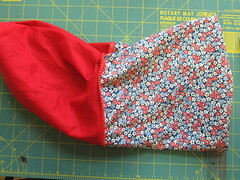 These sacks are quite easy to sew up, I did one in about an hour. 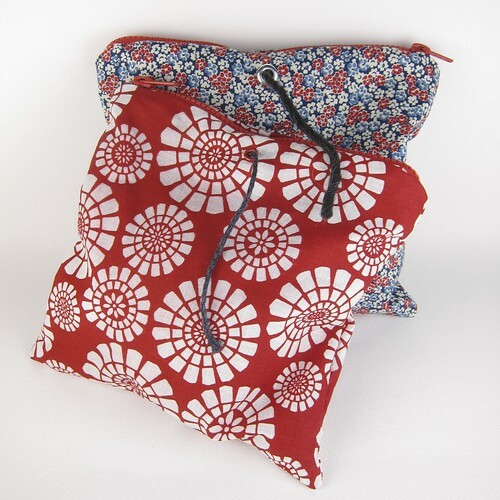 They are a great use for scrap fabric or fat quarters. large tooth plastic sport zipper – It needs to be longer than the size bag you are planning. I used a 12″ for mine. 1. 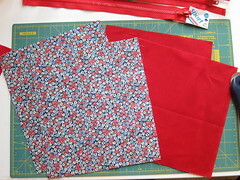 Cut four squares or rectangles of fabric the same size. The size is up to you, think about what size balls of yarn you will mainly carry, sock yarn needs a smaller sack than bulky yarn. 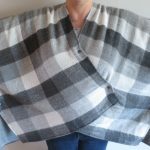 Once you have decided on the size make sure the fabric squares are 1″ bigger all around to allow for a 1/2″ seam allowance. For one sack I did 10″ x 9″ rectangles and for the other I did 9″ x 9″. They will hold two balls of sock yarn or one larger bulky ball. Two pieces of fabric will be your interior and two will be your exterior. 2. 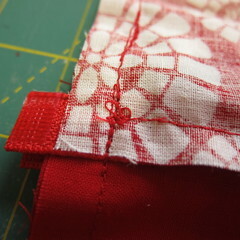 Lay a piece of the interior fabric down with the right side facing up. 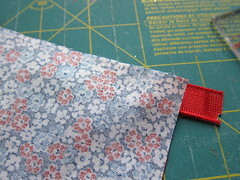 Place the zipper on top of it with one edge even to the edge of the fabric. You want the zipper to be right side up. Make sure the end of the zipper where the pull is when the zipper is closed it about 3/4″ to 1″ from the edge of the fabric. I pinned the zipper in place just to hold it until I basted it in. 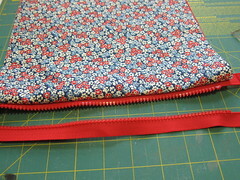 Lay one of the exterior fabric squares on top of the interior one and the zipper with the right side facing down. So you end up with a sandwich fabric with the zipper in-between and the right sides of both fabrics facing in. Baste the fabric and zipper in place. I find this easier to do with the zipper open. 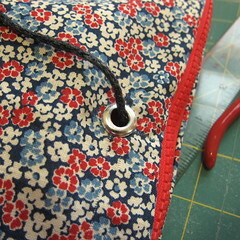 Use the zipper foot on the sewing machine to sew the zipper in place. Fold the two pieces of fabric back. Now repeat with the other two pieces of fabric on the other side of the zipper. 3. Open the zipper about halfway. Open the fabric so the right side of the exterior fabric pieces face each other and the right side of the interior fabric pieces face each other. Pin together. 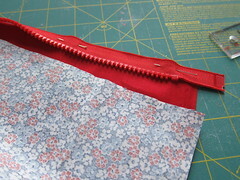 At the end of the zipper that is open, pin the selvedges and edges of the zipper towards the interior fabric. 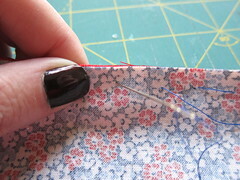 Using a 1/2″ seam allowance, sew the three sides of the exterior fabric. 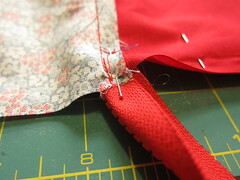 Get as close to the closed end of the zipper as you can, you will not be able to sew over it. 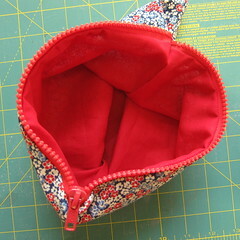 Sew over the open end of the zipper. 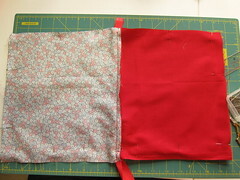 Sew the three sides of the interior fabric, but leave about a 2″ – 3″ opening to turn the sack. 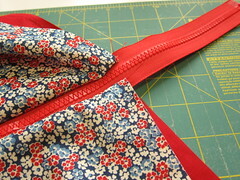 Trim the excess zipper (don’t use your good fabric scissor!). 4. 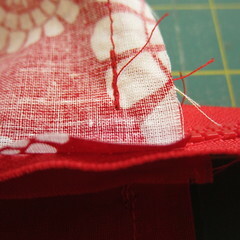 Pull the exterior fabric through the hole in the bottom of the interior. Push the corners out. 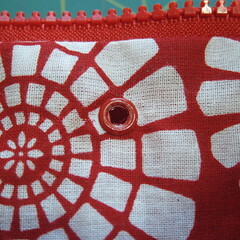 Sew the hole at the bottom on the interior shut then push the the interior inside the exterior. 5. 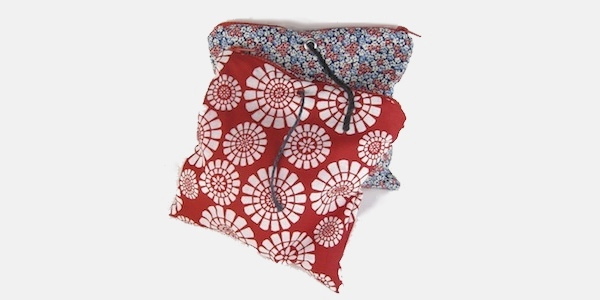 Follow the instructions on the eyelet attachment tool to put a eyelet on one side of the sack through both the interior and exterior fabric. The smaller eyelet will work well for sock up to aran size yarns. Use the larger eyelet if you want to use bulkier yarns. I know a few knitting friends that will be getting these for Christmas from me. Using the grommets was a brilliant idea! That is brilliant. I’ve been coveting those beautiful yarn bowls you can get which have a hole in the side, but actually these are even more useful because they are portable. Can I be one of your friends for Christmas! these are awesome! I’d make one but darn no sewing machine. Hum…now if I could only get a friend to sew some up for me..
Great idea; so simple and so practical. I don’t knit, but I can see pairing this with what Michaels, and some other companies, call a bubble tote (oval, rigid plastic with a flat bottom and holes for handles). This is EXACTLY what I need to keep my cat from eating my yarn while I knit! Thank you, thank you, thank you! Adore this idea. Will work wonders to keep the dog hair off my yarn! Thank you for this tutorial. I am about to sew a third and fourth sack for two more knitting friends. I enjoy making and giving these as gifts. Thanks again!